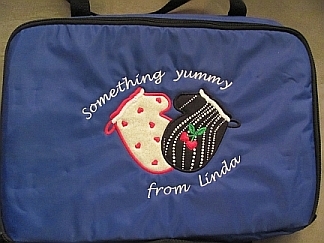 You will love this insulated, vinyl lunch tote! It is a roomy 9 x 7 x 3 inches and has an adjustable, detachable shoulder strap in addition to the carrying handle. It features double zipper pulls on the nylon zipper. Available in royal blue. The interior is white. Your name, monogram or single initial make it personal at no extra charge. These make a great back to school lunch tote, too! Add a symbol to represent a favorite activity or special interest for just $3 more.